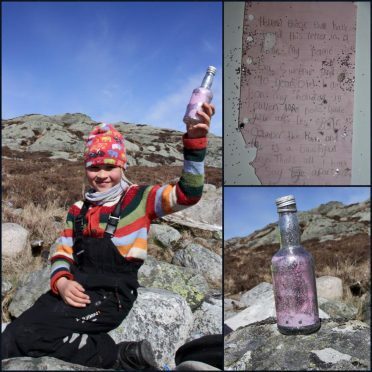 A message in a bottle dropped into the sea by a young girl visiting a historic Moray village last year has washed ashore in Norway. Ten-year-old Eva Sweenie placed the handwritten note inside the bottle in October when she was holidaying in Cullen with her family. The missive travelled more than 300 miles across the North Sea to reach the port of Askvoll on the west coast of the Scandinavian country. It was scooped from the waves off a small island called Hindoy by seven-year-old girl Signe Rege, who reached out to Moray locals to help her track down Eva. Staff at the Cullen Bay Hotel canvassed residents and found out that Eva had been visiting the seaside spot from Dumbarton. Owner Rena Watson said she was overjoyed at being able to help put the two girls in touch. Mrs Watson added: “Both the girls seem absolutely delighted. Eva’s mum, Gill Sweenie, added: “This has come as a brilliant surprise. “Eva had a great time in Cullen, and she can’t wait to hear from Signe now. The family will return to Cullen this October and plan sending another message in a bottle when they do. Eva’s letter reads: “Hello, those who have found this letter in a bottle, my name is Eva Sweenie and I am 10 years old. “I am on my holidays in Cullen, who knows where you are. “It’s 2015 and October the 16th, and this is a beautiful day.